Nine people were taken to three local hospitals, Andrew Thomas, the chief medical officer for OSU’s Wexner Medical Center, said at a news conference. One of those injured was in critical condition. “Around 9:52 a.m. the emergency dispatch center got a report that a vehicle had struck pedestrians. “At 9:53, an OSU [Police Department] officer called out on the radio that shots were fired. He engaged the suspect, who had gotten out of the vehicle after hitting pedestrians. The suspect cut multiple individuals. “We’re very fortunate that an OSU PD officer was there and took quick action,” Moll said, “and we believe that injuries were minimized as a result of that.” Police later identified the officer as Alan Horujko. According to The Lantern, OSU’s newspaper, Hurujko is a 2012 graduate of the university and joined the campus police force last year. Ohio State University Police Chief Craig Stone said this was a deliberate attack. “To go over the curb and strike pedestrians, and then get out and start striking them with a knife — that was on purpose,” he told reporters during the news conference. Neither the suspect nor the victims have been identified. Law enforcement also has not commented on a potential motive for the attack. OSU’s emergency management division first tweeted a warning about an active shooter at 9:56 a.m. local time: “Buckeye Alert: Active Shooter on campus. Run Hide Fight. Watts Hall.” Watts Hall houses the Materials Science and Engineering department. 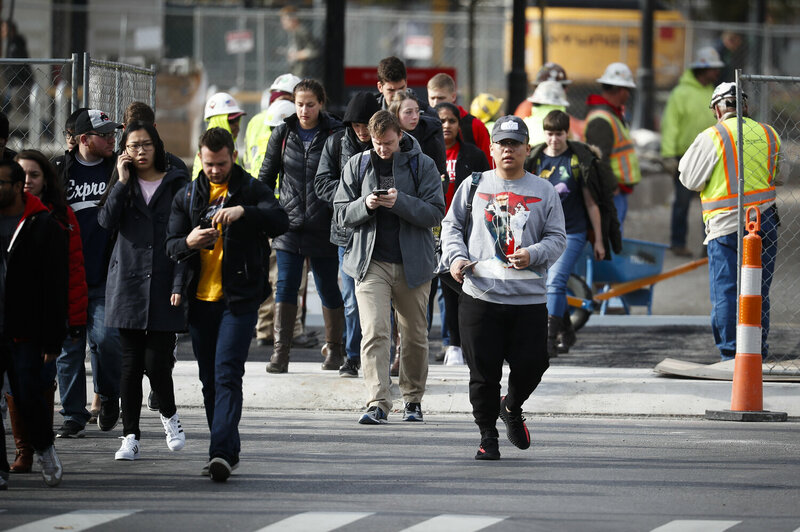 Students leave buildings as police respond to an attack Monday on campus at Ohio State University in Columbus, Ohio. Multiple law enforcement divisions were part of the response. Columbus Ohio Police said SWAT, K-9 units, negotiators and a helicopter unit were on the scene, with OSU Police taking the lead in the situation. The ATF’s Columbus Field Division said it also sent agents. An OSU directory record said Artan majored in Logistics Management. An individual with the same name and major spoke with The Lantern in August. He said he had just transferred from Columbus State. “I’m new here. This is my first day. This place is huge, and I don’t even know where to pray,” he said, and added that Columbus State had designated rooms for Muslims to pray. “I wanted to pray in the open, but I was kind of scared with everything going on in the media.